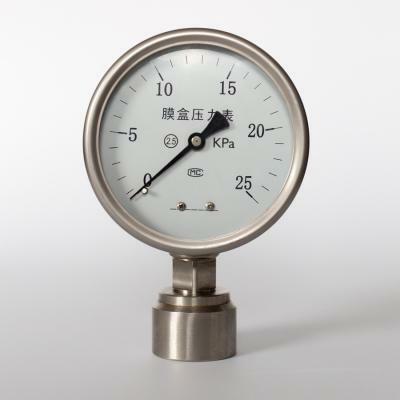 The main type of natural gas pressure gauge is capsule pressure gauge, which is also known as micro-pressure gauge. It is used to measure the micro pressure of liquid, gas or steam that is non-explosive, non-crystallizing, non-condensing while corrosive to copper and copper alloys. Capsule pressure gauges use capsules as sensing elements for measuring minor pressure. It measures micro-pressure and negative pressure of non-explosive but copper-corrosive gases, and has been widely used in boiler ventilation, gas pipelines, combustion devices and other similar equipment. The stainless steel capsule pressure gauge is produced in accordance with the pressure system and the shell of it is made of stainless steel. It is applied to the measurement of micro-pressure and negative pressure of gas mediums in the technical process which has a demand of corrosion-resistance. Stainless steel capsule pressure gauges are developed from original capsule pressure gauges, at the same time, it is equipped with the function of corrosion-resistance. It is used in boiler ventilation and gas pipelines and other equipment, measuring the micro-pressure and negative pressure of a variety of gas mediums in high demand processes. The accuracy degree of capsule pressure gauge is 2.5. Welcome to contact SILVER AUTOMATION INSTRUMENTS for more related products for pressure measurement.